To define in Windows 8.1 / 10 a file type associate to open with multiple programs or apps, please open the "Default Programs" settings! control.exe /name Microsoft.DefaultPrograms /page pageFileAssoc or open default programs and tap or click the text "Associate a file type .... a program"
See also: The wrong program opens a file in Windows-8? (Image-1) Set file associations in Windows 8. If you want to choose which file types and protocols a program uses by default, tap or click choose defaults for this program. Note, if a program doesn't show up in the list, you can make the program a default by associating a file type or protocol with it. Use this option to fine-tune default programs based on the file type or protocol. For example, you can have all jpg image files open, using one program and bmp image files open, using a different program. Windows-8 - FAQ-74: How to set in Windows 8.1 / 10 associations for file type: open with multiple programs or apps? Set file associations windows 8? Set file types in win8.1? Set a file in windows 8? File type assoc setting windows 8.1? Windows 8.1 associate a file type? Windows 8.1 DDE file type? 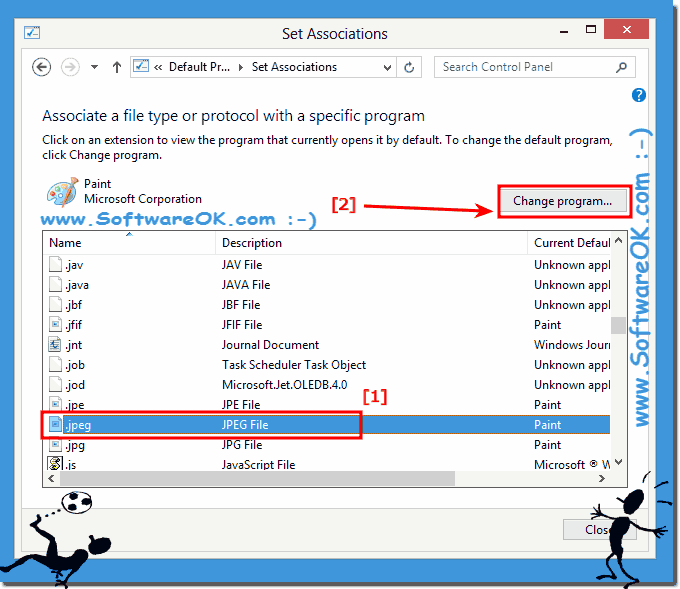 How to Associate a file type or protocol with a program in Windows 8? How to set file types opening windows 8.1? Windows 8.1 file open with options? Windows 8.1 file type open? File types settings windows 8? Windows 8 open with file associations for Windows 8.1 image file type? Open with windows 8 file type? Overview file types in windows 8 and Windows 8 associate file type? How do I set advanced file associations in Windows 8? Open with in windows 8.1?